Maybe you noticed I started up a new series last week called Home Hop where another blogger takes us on a tour of their fabulous homes. (If you missed it, check it out here.) Today I'm super excited to introduce a whole different kind of home - a cozy 650 sq ft Chicago condo owned by the talented Kim & Scott of Yellow Brick Home. I won't give more away other than I call it: White and Bright. Eek, we're over the moon that Mrs. Limestone is sharing our Chicago condo with her readers! We're Kim & Scott from Yellow Brick Home, two homeowners in the Windy City sharing our pad with a spunky pup and two cats. And all under a 650 square foot roof. Nestled on the second floor of a corner building, our home includes an open concept main living area, a shotgun hallway, and two teeny bedrooms. Oh, and a warning. We kind of have a thing with color. As in, we kind of love it. Upon entering our front door (there on the right), you'll come into what makes up for the bulk of our living space. Our kitchen and living area share the same open room, and straight ahead, we've got the premo place to paint and eat. And while the hubs makes dinner, I can share a conversation with him while relaxing on the couch. And vice versa, of course. Here's a better view of the front door, which leads to our hallway. We've sectioned off the larger living room wall with a splash of cheery green, and continued it onto the wall in our foyer. By doing so, I think we lend a bit of continuity to a room that could stand the extra square footage. We also keep up with constantly evolving (and growing) mini art collection by the front door. We tossed up a handful of carefully placed shelves and added a gaggle of special-to-us art that we've collected over the years. And because this room is where we spend most of our time, we keep pillows and throws within arms reach for those lazy Sunday movies. Living Room (opposite)Here it is from the other side, peeping into the kitchen. Our khaki, wood-framed chair serves as a sort of room divider, while still allowing the flow from living to cooking. If we're craving a bit more privacy (and if those dishes are piled just a bit too high), we also have the option of pulling our curtain dividers taught. After all, the dishes can wait 'til tomorrow, right? Out of sight, out of mind. Consider this a kitchen "before" shot. Scott and I have plans (and soon!) to revamp this space, which shouldn't be too involved since the bones are pretty solid to begin with (fingers crossed). We've dabbled in the idea of a chalkboard backsplash and clean, white walls for a little punch of fun and contrast. Buh-bye honeydew walls. And as mentioned before, this pint-sized buffet table acts as not only the perfect setting for our make-shift art studio (you can see what we do at the Pet Shop), but it's also just right for a dinner for two (or four if we're pushing it). When not in use for eating or creating, it at least looks pretty while acting as part-kitchen-slash-dining-slash-living-slash-art-making. Our narrow, winding hallway lends us the perfect hiding place for some storage. Our bedroom is on the left, hidden around the bend is our office, and we even got so lucky to have a hidden stacked washer/dryer and coat closet. Oh, and the wallpaper? It was love at first click. First stop on the hallway tour - bathroom. We all have one. Here's ours. It's been through too many transitions to count, including our most recent color revamp. And although you can wash your hands, handle your business, and turn on the shower - all while standing in the same place and without moving an inch - it works. Perhaps one of my favorite photo collections in our home resides in this room. There is just something about unexpected photos, art, and trinkets in a bathroom that makes me smile. Mismatched towel hooks and an assortment of photo strips lend a bit of personality to a place where you'd least expect it. Our office has been through so many transitions, it's impossible to even count. Originally housing a fold out futon, it was meant simply as a guest room and nothing else. Problem was that the futon was mini-sized (heck, it had to be in this 8'x10' space) and the out-of-town friends and family just weren't into the teeny bed. Out with the sorta-bed and in with the sideboard. Truth is, we were catering our small space for the occasional friend pop-in, and not for us. Call it what you will, but we ultimately rearranged the space to fit our needs, and our needs meant storage, desk space, and shelves for overflow. The oval just-ten-tiny-bucks mirror was scooped up at the flea market (fate, we say), and our collection grew when we picked up the vintage inspired addition at the Vintage Bazaar. While the rest of our room relies on white accents against an almost navy wall, the (lovely) gaudy frames provide an unexpected pop. And may I say, our money-hoggin' snail looks quite happy holding down the fort. Probably the most efficient use of space we have on display is our bike storage. Although it may look a little scary from below, I assure you that it's super sturdy and efficient (while the hubs is surely enjoying his manly "art"). Hiding behind the office door is the perfect little niche. An extra seat for an overflowing amount of guests is tucked away, and the hubs has a tidy spot for grabbing his favorite caps on the go. We spiffed up the decorative hooks with a touch of gold paint, mimicking our flea find. Because this nook is concealed behind the door, no one's the wiser, and yet we gain those much appreciated few extra inches of tucked-away storage. This Seattle Show Posters original, trimmed to size, tucks neatly inside the shadowbox of an Ikea Ribba frame. We love that it can only be seen while facing the hall (or laying in bed, depending on how you want to look at it), which makes it feel like our own secret print. Love. It. Last (but certainly not least) is our back patio. Every inch counts in a home of this size, and that patio ain't chopped liver. During the warm weather months, that extra landing of 7'x10' welcomes our closest pals with open arms. The sizzle of burgers on our little grill and sound of friendly chatter make it all the more enjoyable. There you have it. All 650 square feet of it. One open living room and kitchen, a bitty bathroom, one bedroom, and one office. More than enough space for this team (and a dog and two cats). We love each and every inch, and we think our furballs have got it pretty all right, too.  And a big muchas gracias to Mrs. Limestone for allowing us to open our doors to you! Do you want to show off your home? Email me! OOOOOOOOOOOOOOOOO......I have seen their place on Apartment Therapy. Very cool!! Love all the color. KIm and Scott I love your home and am so thrilled that Mrs Limestone featured you! 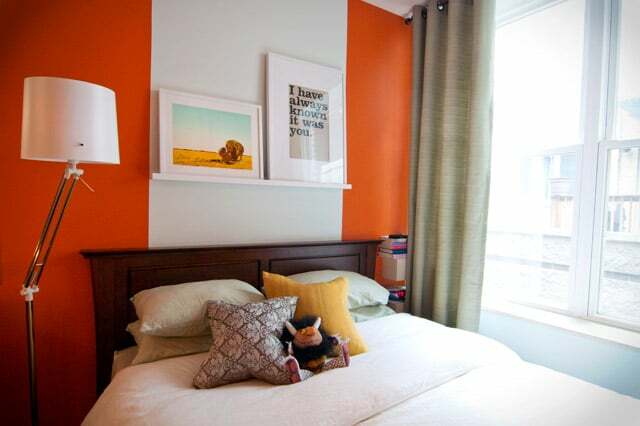 The pops of color and space saving ideas are great as is your art collection! GREAT COLORS, LOVE THE GREENS AND THE BLUE! What a great condo! Your use of space for keeping organized is stellar! Love it and nice to see someone who is so into color....very chic. Loving this new edition Mrs.L to your blog! We live in a small condo, and I love looking at other small homes. I love all of the color! I'm a color kind of girl myself. This place is so fun and cheerful. There's no way you can be anything but happy in such a colorful, playful home. Awesome! What a fun home! I love all of the color too. :) They have definitely used there sq. footage in a perfect way. Holy Colour, Batman!! It looks so fresh and fun! Do they have TWO TVs in their bedroom??? Love that GREEN!! A similar shade was also featured in the January issue of Vogue... Merry Christmas and BEST wishes for you in the upcoming NEW year!! Although... our room isn't that outrageous orange anymore! I covet that HAND. And I have that yellow flower pillow too - great space! Love it all, from the green accents in the living room to the little yellow quails and orange elephant. I think my place is in need of some brightly painted animals. Love Home Hop!! I love seeing beautiful homes and how people really live. thanks for sharing. Merry Christmas to you and yours! Love it! And the fact that they live in Chicago where I do, makes me love it even more! I'm so impressed with what they've done with their space! Good for them for not being afraid of color! I love all the little interesting pieces and art here and there. Where did you purchase the black and white pendant drum light in the kitchen? It's gorgeous! The kitchen pendant came from Overstock.com, and thank you! The new finish for your cabinets is great! Perfect with the walls.